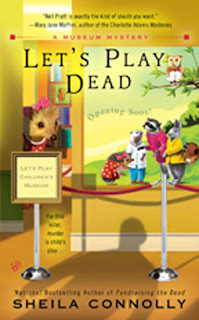 I don't usually blow my own horn, but after the unkind things that Arabella Heffernan at that tatty little children's museum, Let's Play, said about me recently, I felt I really had to defend myself, if only for the sake of my many, many fans (who of course will not believe Arabella's libelous slurs). I'm the world-famous author of the Harriet the Hedgehog series, which has sold millions of copies (well, hundreds of thousands, or at least, that's what my agent told me, before she quit) in many countries of the world, and has been translated into fourteen languages. Harriet is a hedgehog with a charming collection of friends, and I try to use her adventures to teach children gentle lessons about getting along with others, sharing, and looking for the best in people, or animals. There are no buttons to push, and nothing lights up. I don't know what has gotten into children these days--they want a book to do all the work for them. If you can even call it a book, when it sings to you and the characters address you by name. Still, my publisher was a bit concerned about what he called my "relevance" in the current market for children's books, so he thought participating in an exhibit at that children's museum--which I'm told is very popular among the under-three-foot crowd--would be good publicity. I thought that the museum would benefit more than I, but I was happy to comply, and I have tried to be gracious. But Arabella and her rag-tag crew of exhibit designers are not as scrupulous as I am about accuracy. She had the nerve to call me demanding when I insisted that the head for Willie the Weasel be redone, but they simply hadn't gotten it right the first time. Or the second. Do I have children of my own? No, I haven't been blessed that way. And none of my relationships has lasted long enough to even consider it. But I've tried to make my contribution toward giving the little darlings some happiness with Harriet and her friends. I do hope Arabella can keep their sticky little fingers off the exhibit creatures--she seems to think that children should be allowed to play with them. I hope you'll understand that I am not a diva, no matter what Arabella says. And I hope that this pesky exhibit will inspire children to read more of my books--I can use the sales. I can hardly wait to visit the children's museum and see Harriet the Hedgehog and her friends. I completely agree that you are not a diva nor demanding in any way at all... and I'm being completely sincere! And your books sound delightful. I'd LOVE to read one!